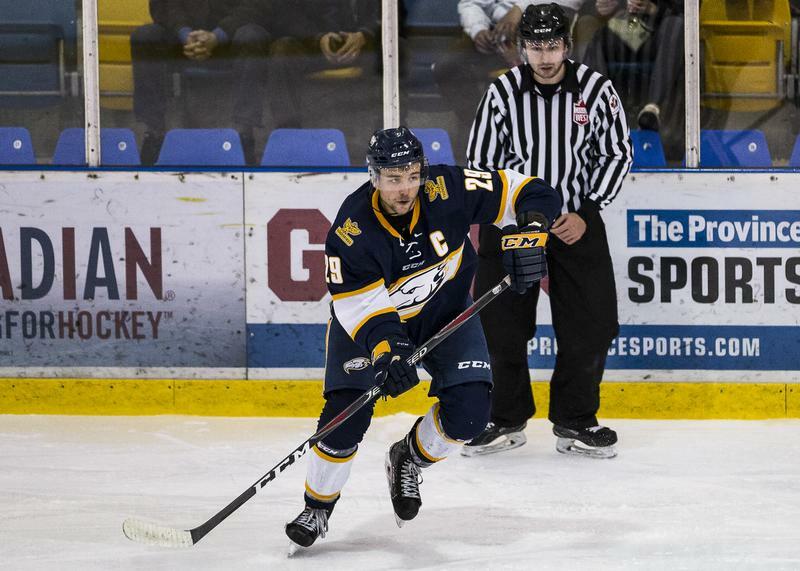 In the dying seconds of overtime, with the puck in the corner and UBC on the penalty kill, defenseman Jerret Smith shows why he wears the “C” for the Thunderbirds. Although he could have tried to clear the puck, Smith instead lays on top of the puck and takes a beating from the frustrated Alberta forwards as they try, without success, to dig the puck free. It was not the easy play — but it was the right play. One reason for this selfless attitude could be the man who first got Smith into hockey. Like many other youth hockey players in the Lower Mainland, Smith was also a big Canucks fan growing up and looked to defenseman Ed Jovanovski and Canucks captain Markus Naslund as role models. His own hockey career would take him south of the border, though, as a member of the Seattle Thunderbirds. On that team, he played with future NHL players like Matthew Barzal and Shea Theodore. He played there for four years. After his stint in Seattle, Smith decided to return to BC for school while remaining apart of a Thunderbird hockey team. When describing the biggest challenge he faced in the transition from WHL to U Sports, Smith pointed to the experience of the players as a big adjustment. This year is the third season that Smith has worn the UBC Thunderbird logo. Most importantly, it’s one that has proved fruitful for the defenseman. In addition to being named captain, Smith was also named to the U Sports All-Star team that played the Canadian World Juniors in a December exhibition series. “It was [a] cool experience. Some of the guys I played [in Seattle] — they were younger than us, but their speed and talent was just unbelievable,” he said. The decision came after a stellar four-goal game for the Thunderbird veteran just weeks prior. But, at this point, you probably can guess what he says when describing this impressive individual performance. While many others would have bragged about their achievements, it’s clear that Smith is different. His achievements are that of the team too — a mark of a true leader.